If you're craving something sweet, but don't want to load up on calories, go for berries! 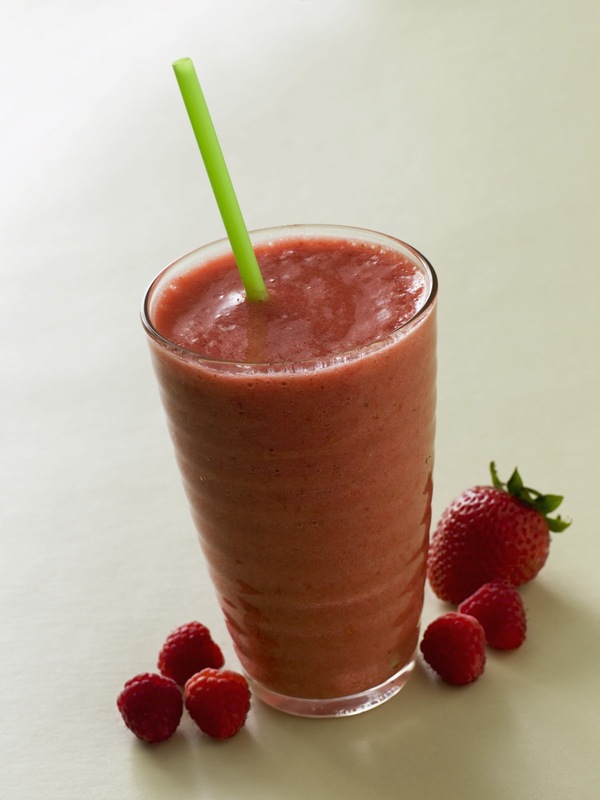 This smoothie combines the natural sweetness of four different berries along with the creaminess of low-fat yogurt to create a satisfying snack for your entire family. It's also packed with vitamin C, dietary fiber and antioxidants. Here's to your health! Long winter days are fading into warmer weather, which may mean there's an end in sight for your spring fever. Perhaps you're ready to get outside and stretch your legs, hoping to lose some of your winter weight. Before you dust off your running shoes, read some of these helpful hints to ease back into a fitness routine. Slow and steady wins the race. If you've had a sedentary winter, try walking a few times a week before gradually adding more activity. By slowly adding intensity to your workouts, you'll help to avoid injuries. Two is better than one. Find a partner you can work out with each day. Whether it's your best friend, next door neighbor or your dog, having someone to exercise with holds you accountable to yourself and to your partner. Keep a journal. Start writing down your workout activities. You might include the day of the week you worked out, amount of time you exercised, the activity you took part in and how you were feeling that day. This allows you to go back to see what activities worked best for you and also helps you track your progress. Have fun! Be sure to integrate activities that you enjoy such as biking, hiking or swimming. This will help ensure you keep on the workout track without getting bored with your routine. Be sure to see your physician before starting any new workout routine. To find a primary care physician, visit www.gbmc.org or call 443-849-GBMC (4262). A honeymoon filled with chemotherapy and radiation wasn’t exactly what Phil Kenney had hoped for himself and his new bride, Linda. However, that’s exactly how they spent the weeks following their wedding. It all started in March 2010, when Mr. Kenney was diagnosed with stage IV tonsil cancer. After learning of his diagnosis, Mr. Kenney proposed to Linda, his girlfriend of more than 20 years. On April 17, 2010, one short month after the proposal, the couple was married in a full Catholic wedding. Instead of taking a tropical honeymoon, the following six weeks were spent at GBMC as Mr. Kenney began treatment. He had been referred to GBMC’s Sandra & Malcolm Berman Cancer Institute, where he could seek the help of head and neck specialists at the Milton J. Dance, Jr., Head and Neck Center. Though it was 300 miles round-trip from the couple’s home in Frostburg, Maryland, they knew that GBMC is where Phil could best receive the comprehensive care he needed. During the weeks of Mr. Kenney’s treatment, he and Linda stayed at the Hope Lodge, a low-cost residence run by the American Cancer Society for cancer patients undergoing treatment more than 40 miles from their homes. Once he had recovered from surgery, his schedule consisted of radiation therapy twice daily on GBMC’s state-of-the-art RapidArc Linear Accelerator and chemotherapy at the Infusion Center once a week. Like all of GBMC’s cancer patients, he also had access to the support of his surgical team, along with other extensively trained oncology professionals like speech pathologists, social workers, voice and swallowing experts, patient navigators, radiation and medical oncologists and a specialized oncology dietitian. Mr. Kenney is back home in Frostburg after completing his treatments, but the care he received at GBMC has made a lasting impression on him and his wife. For more information about the Sandra & Malcolm Berman Cancer Institute, call 443-849-GBMC (4262) or visit www.gbmc.org.